Diplomatic Defections, Petro-Pressures: Where Is The Venezuelan Crisis Headed? Venezuelan National Assembly President Juan Guaido rallying supporters in Caracas this week in his efforts to remove Venezuelan President Nicolas Maduro from office. A top official at the Venezuelan consulate in Miami on Monday recognized National Assembly leader Juan Guaidó as the rightful president of Venezuela. First Consul Scarlet Salazar was just the latest diplomat to abandon Venezuelan President Nicolás Maduro. The authoritarian socialist leader is facing an ever-growing chorus inside and outside his country demanding that he leave office. WLRN's Christine DiMattei spoke with Americas correspondent Tim Padgett about the rapid developments in this crisis – and about whether or not Maduro can survive it. DIMATTEI: Tim, briefly remind us how we got here. Why do so many in Venezuela and the international community, including the United States and a host of Latin American countries, insist that Maduro is no longer the legitimate president – and Guaidó is? PADGETT: Most legal experts say Maduro's re-election last year was unconstitutional – and therefore his re-inauguration this month was essentially illegal. So in that case, Venezuela's constitution says the leader of the National Assembly – Juan Guaidó – becomes interim president until a new, legitimate election can be held. How significant was it to have a top Venezuelan diplomat stationed right here in Miami defect to Guaidó? I think very significant. I mean, South Florida is the epicenter of exile opposition to Maduro's regime. So the symbolism is pretty heavy. And it has a psychological effect inside Venezuela because it also suggests that Venezuela's usually dysfunctional opposition has finally become effective – and therefore worth following. On Monday the United States slapped heavy sanctions on Venezuela's state-run oil company, PDVSA. How much financial pain is that going to cause Maduro's regime? Potentially quite a bit. These new sanctions essentially stop the revenue from Venezuela's oil exports to the U.S. from getting back to the Maduro regime. Theoretically, they'll now go to a blocked escrow account eventually to be controlled by a new Venezuelan government. South Florida is the epicenter of exile opposition to Maduro, so the Miami consulate defection has pretty heavy symbolism - and it could have a psychological effect inside Venezuela too, an indication that the usually dysfunctional opposition has finally become effective and therefore worth following. Thanks to the economic catastrophe the socialists have created in Venezuela, the Maduro government is running out of money. And the Trump administration thinks the oil sanctions could cost Maduro's regime as much as $11 billion this year. EU countries are also poised to recognize Guaidó as president, and they could block Maduro from accessing other assets – like more than a billion dollars' worth of Venezuelan gold sitting in Great Britain. The question is how much more pain these actions will cause the average Venezuelan, who is already suffering quite a bit. But will it be enough to convince Venezuela's military commanders to go over to Guaidó's side? Does any of this matter if that does not happen? You're right, the Venezuelan military leaders are the key. They're the only thing keeping Maduro in power, and they're staying loyal to him so far because he's made them the bosses of so many lucrative government ventures, like oil production and food distribution and – according to US indictments – drug trafficking. So for them to abandon Maduro, the money they get has to dry up as a result of these U.S. and international sanctions. And they also have to be convinced that the amnesty Guaidó is promising them will keep them out of jail. U.S. officials warn that if any of its diplomats from the embassy in Caracas are harmed it will provoke a strong response. Do you think that means U.S. military intervention? 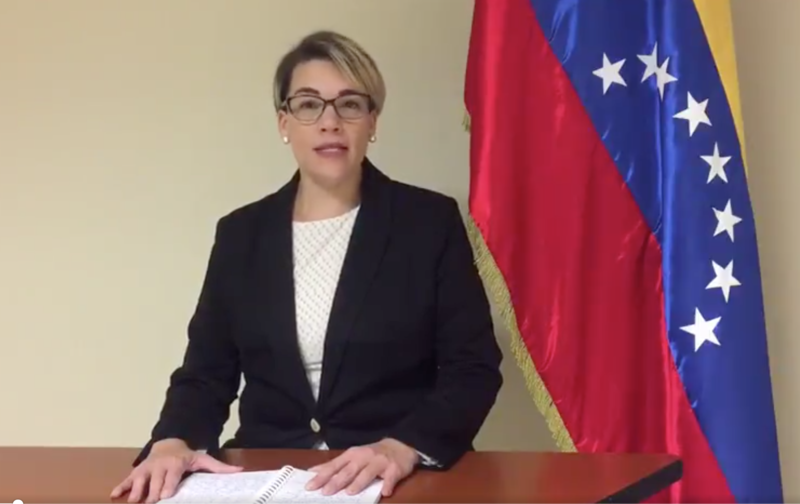 Scarlet Salazar, first consul of the Venezuelan consulate in Miami, announcing in a video on Monday that she'll recognize Juan Guaido as the legitimate president of Venezuela. Well, the Trump administration keeps insisting that option is still on the table. But, obviously, one hopes that would be the absolute last possible resort because any sort of yanqui military intervention would tear down the credibility of what has so far been a diplomatic effort to restore democracy in Venezuela. I mean, it would look just like yet another U.S.-engineered coup in Latin America. The U.S. also just named Elliott Abrams as its "special envoy" on Venezuela policy. A lot of people have a problem with that. Why? As a Reagan administration official in the 1980s, Elliott Abrams became the poster boy for some of the uglier U.S. intervention and human rights abuses in Central America's civil wars. He was convicted in the Iran-Contra affair, for example. (He was later pardoned by President George H.W. Bush.) So to a lot of people, placing Abrams at the head of U.S. efforts in Venezuela risks corrupting that diplomatic credibility I just spoke of. Guaidó is calling for more massive anti-Maduro street protests on Wednesday. Is he at bigger risk now of being arrested – and are his followers facing a bigger threat of brutal treatment from Maduro's security forces? Right now, surprisingly, I don't think he's in danger of arrest because it would just bring a lot more international pressure down on Maduro's head. And sources I spoke with at embassies that recognize Guaidó as president say they're ready to give him refuge if he feels he's about to be arrested. But we are seeing a brutal response from Venezuelan state security against protesters – not so much from the military this time but from secret police forces inside the barrios. Human rights groups say dozens of demonstrators have been killed and hundreds more jailed – and it could get uglier the longer this standoff drags on. One of the four diplomats working at the Venezuelan Consulate in Miami issued a video recognizing National Assembly leader Juan Guaidó as interim president of Venezuela.